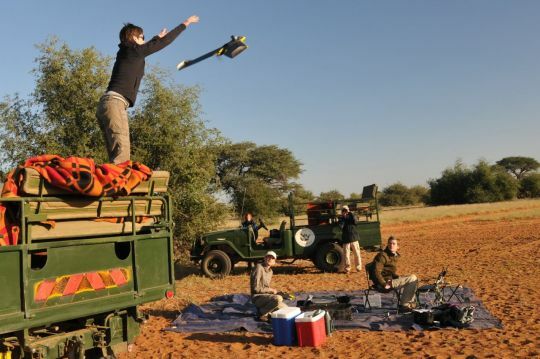 Exactly one year after our first mission to Namibia for the SAVMAP project, a team made up of Drone Adventures, EPFL’s LASIG lab and Kuzikus Wildlife Reserve came together again in the Southern African savanna from May 16 to 23, 2015 to apply last year’s findings and push the limits of civilian drone use for nature conservation applications one step further. Protecting endangered animals like the Black Rhino and plants like the endemic and fascinating Welwitschia mirabilis, proposing new ways of managing land sustainably in semi-arid savannas and finding new approaches to counting wildlife were all important topics on our agenda this year. Land management on wildlife reserves in semi-arid savannas: create updated maps and indices of the same areas exactly one year apart so that changes over time can be analyzed by the SAVMAP team. Animal counting: find new ways of counting wildlife using aerial imagery. After a first try last year (read more in this blog), we expanded our sensors this year and acquired images with not only RGB cameras but also thermal and multispectral sensors to widen the approach of counting animals using drone imagery. Protect endangered animals and plants: find new ways of monitoring the endangered Black Rhinoceros and create maps to count Welwitschia over a large area and 3D elevation models to analyze water catchment and channels. 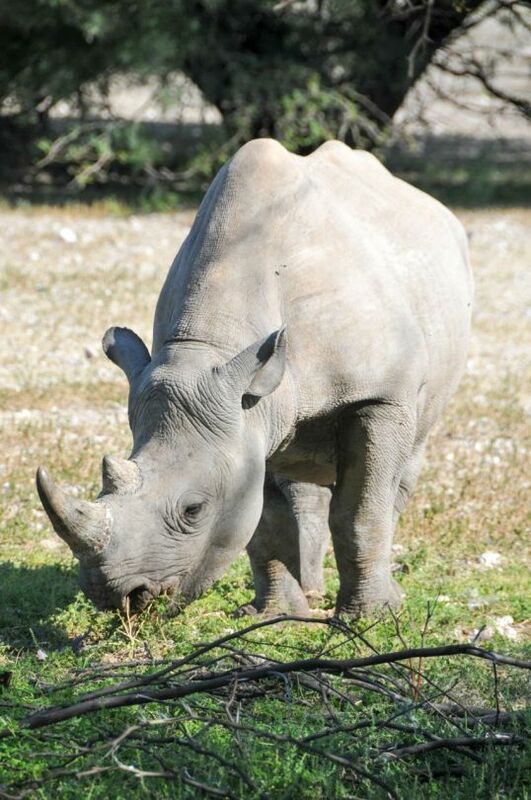 A Black Rhino enjoying his morning meal, unknowingly being mapped from above! During this 9-day mission, we acquired aerial imagery from two specific desert environments. 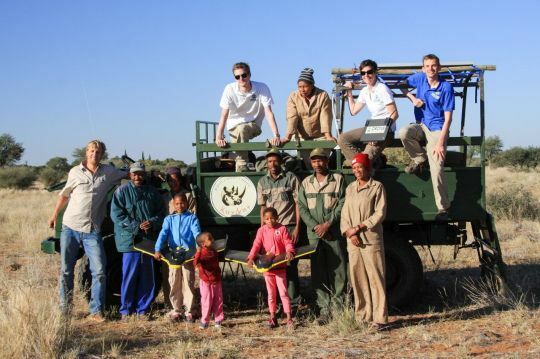 The first week was spent on Kuzikus Wildlife Reserve, set in the Kalahari desert. This large semi-arid and sandy savanna extends over 900’000 square kilometers, covering the South East of Namibia, much of Botswana and parts of South Africa. A semi-desert with huge tracts of excellent grazing after good rains, the Kalahari supports more animals and plants than a true desert, such as the Namib Desert to the west. In Namibia, the Kalahari area is heavily grazed and cattle fences limit the movement of wildlife. With approximately 100 to 200 millimeters of rain per year and the important risk of wildlife fires, sustainable management of the grazing grounds is the key to survival, not only for the wildlife and cattle that populate the area but also the local communities and farmers that call the Kalahari their home. After over 50 flights and datasets in the bag, we crossed the country to fly our eBee drones in the harsh environment of the Namib desert. Teaming up with local researchers at Gobabeb Research Center, located on the northern boundary of one of the world’s oldest deserts, we planned on mapping two valleys to create high-resolution maps and 3D models. Due to heavy winds and the short time on site, we were able to only map one of the valleys and took advantage of some free time to give a conference to Gobabeb’s resident students about civilian drones and mapping technology. 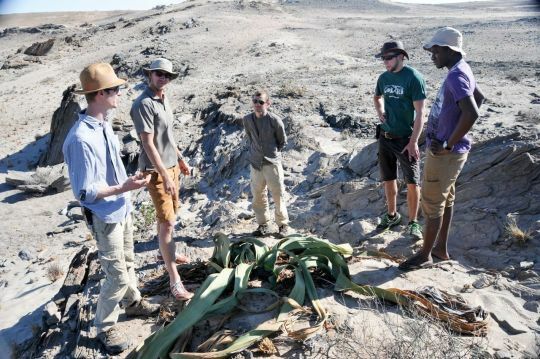 Over the next weeks and months, we will work in close collaboration with EPFL’s LASIG lab, Dr. Friedrich Reinhard of Kuzikus Wildlife Reserve, the Polytechnic of Namibia and the Welwitschia team at Gobabeb Research Center to produce orthomosaics, various indices, 3D models and aerial photo libraries of the mapped areas. Watch out for additional blogs in the coming weeks and months to learn more how drone mapping technology applies to the various goals we set ourselves. We are very curious about the results, and hope that you are, too! The aim of the SAVMAP project is to use near real-time ultrahigh-resolution imaging from UAVs as a basis for developing an integrative monitoring tool for land managers, facilitating sustainable resource management and rare species conservation in semi-arid savanna in Namibia. Read more on SAVMAP here. This second Namibia mission was again made possible by the funding provided from CODEV (Cooperation & Development Center of EPFL) and we thank CODEV for their renewed support. Special thanks also to Kuzikus Wildlife Reserve for hosting us in style as well as to Astrid Bek of Bek & Associates in Geneva for her contribution that provided additional funds used for transporting our equipment. Continued thanks to our partners senseFly, Pix4D and Mapbox for providing their technologies to our cause.